Consider this as the number one rule. Staying hydrated is very crucial during summer as it ensures that your body keeps functioning normally.We can have butter milk, coconut water, Gulkand and of course Sip on flavoured water by adding in mineral rich fruits like watermelon, lemon, kiwi, etc., or make slushies and lemonades at home. Don't skip breakfast. 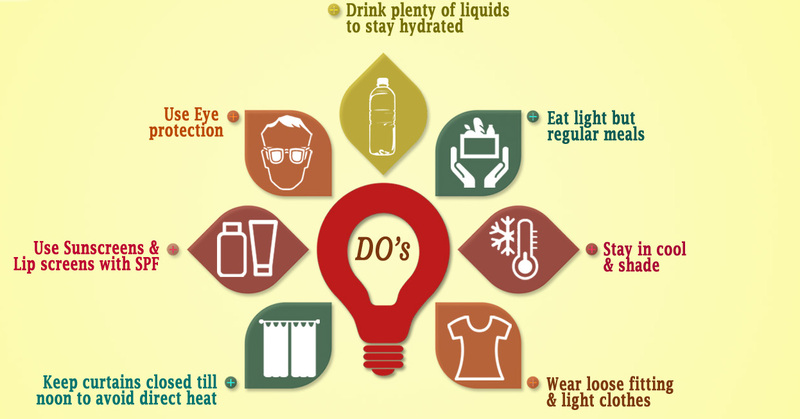 Summer time tends to reduce one's appetite because of the excessive heat. But it is important for you to eat regularly because your body requires the nutrients to fight the heat and keep you healthy. Increase the intake of raw or boiled food. Include as many fruits and veggies in your meals as possible – go for salads, smoothies, and juices. Avoid heat generating foods like meat, eggs and other proteins, and even salt intake. One of the quickest ways to cool down is to step into a cold water shower. It will instantly make you feel refreshed. Too many electric bulbs and lights in the room tend to heat up the temperature. So switch off as many lights as you can and use only the ones you require.Keep the curtains drawn if the harsh rays seep into the house. If you love walking, try to do so only in the early hours or after sun down. Needless to say, to stay cool you need to wear loose clothes so that there is good air circulation. Ditch your synthetic dresses and trousers and stick to cotton. Even while heading out, keep yourself covered from the harsh rays. and you can also try gardening. Use a good sunscreen with correct SPF properly and repeat as frequently as required. Wear sun glasses.